3x6 Bee Blocks in Progress! | sew. quilt. explore. 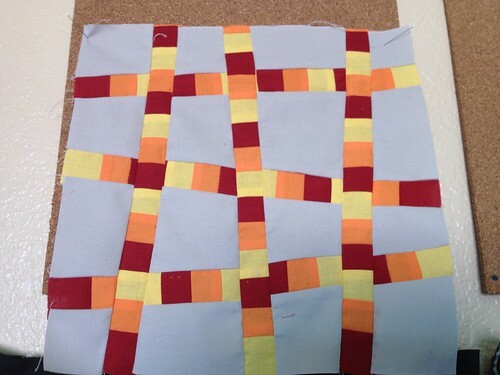 | modern quilting | tutorials: 3x6 Bee Blocks in Progress! So today after I had figured out what kind of block I wanted to do for the 3x6 Sampler Quilt Mini Bee I started on the blocks for my Bee Mates. Go Hive #3!!! This was my test block in my colors to see if what I was thinking would transfer into an actual block. I LOVED it but.... it was too small. By like 1/2 an inch. Grrr.. So I came back about a week later and decided to thicken the strips to make it wide enough. 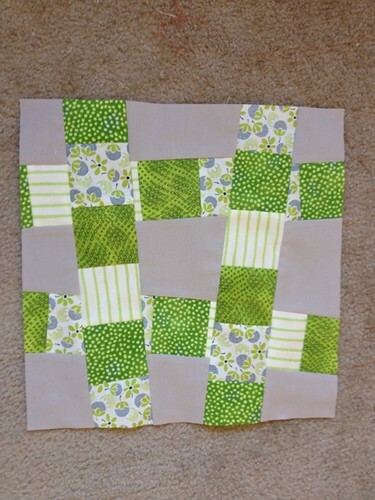 When I was pulling scraps for the first block, greys and greens, I realized that if I did 6 strings that were thicker I wouldn't have enough fabric of the ones I wanted to use, hence the altered pattern. I still think it looks good and it was quicker so I guess it'll work for now. This one is for lel6419 (Laura). I cut the fabrics for KvarnAnna (Anna's) black/grey/white today and will finish that one tomorrow. I like both blocks, but I also really like the test one, boo for shortness!